A fresh tree is a beautiful and a safe tree. Here are a few simple tips that will help your Christmas tree stay looking it's best. Just before you bring your tree inside, make a fresh cut 1/2" above the old cut. This removes the old, dry sap so the tree can draw in fresh water from the tree stand. Place the tree in a sturdy stand that holds at least one gallon of water. Fill with plain water. Water daily. If the water level drops below the cut end of the trunk, a seal will form and the tree will not absorb water. If the tree is not going into the house soon after purchase, store it in a bucket of water on a cool porch or patio away from the wind and sun. Use mini or LED lights. They produce less heat and reduce the drying effect on the tree. Do not try to repair a worn light set; buy a new one. Turn off the tree lights before leaving the house or going to sleep. Place the tree away from heating vents, baseboard heaters, fireplaces, wood stoves and sunny windows. Before the tree dries, remove it from the house and recycle it. Never burn any part of a Christmas tree in a wood stove or fireplace. The sap in a young, green tree pops and sparks creating fire hazards. 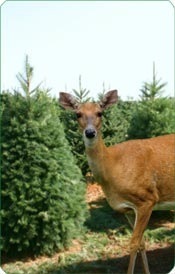 Real Christmas trees benefit the environment and sustain local business. They make your house smell like Christmas, too. Here are some facts about the benefits of our trees. Trees protect the soil from erosion and provide refuge for a wonderful variety of wildlife. While growing, Christmas trees absorb carbon dioxide from the soil and air while also producing oxygen. Real Christmas trees are renewable. We plant one or more trees to replace every tree harvested. A well-watered real tree is less of a fire hazard than a fake tree. For more information about the benefits of real trees, visit the Pacific Northwest Christmas Tree Association. While artificial trees are convenient, they are not made from renewable resources, introduce toxic materials to our homes and businesses (including lead), create a large carbon footprint, will never break down (polluting the environment for thousands of years), are usually manufactured overseas, and pose a fire hazard. In addition to off-gassing toxic fumes your family will breathe, artificial trees can't replicate the great smell of a real Christmas tree.